British Christian and political leaders praised Egypt’s embattled Coptic Christians during Pope Tawadros II’s pastoral visit to the UK, the first by a Coptic Pope. Tawadros’ visit follows Pope Francis’ visit to Egypt during which he told the head of the Coptic Church: “The innocent blood of defenceless Christians was cruelly shed,” adding: “Your sufferings are also our sufferings.” Sporadic attacks against Egypt’s Christians have become more frequent and more deadly since February, when Islamic State released a video vowing to increase attacks against the Coptic community. 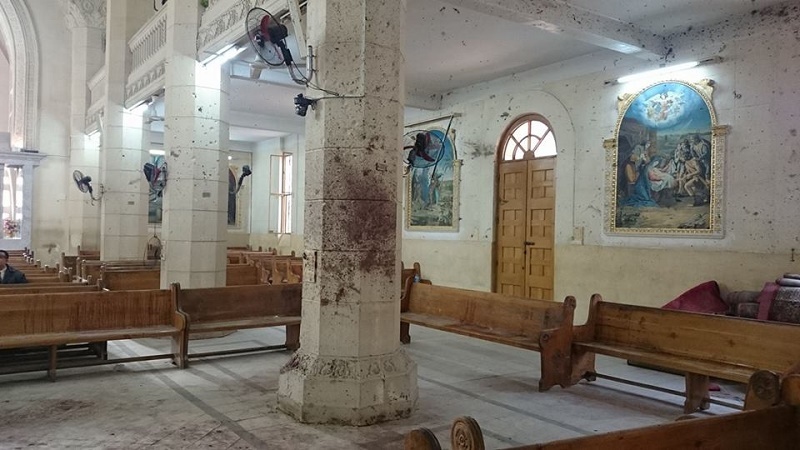 Some 47 worshippers were killed in two suicide bomb attacks on churches, one of which appeared to target Pope Tawadros. 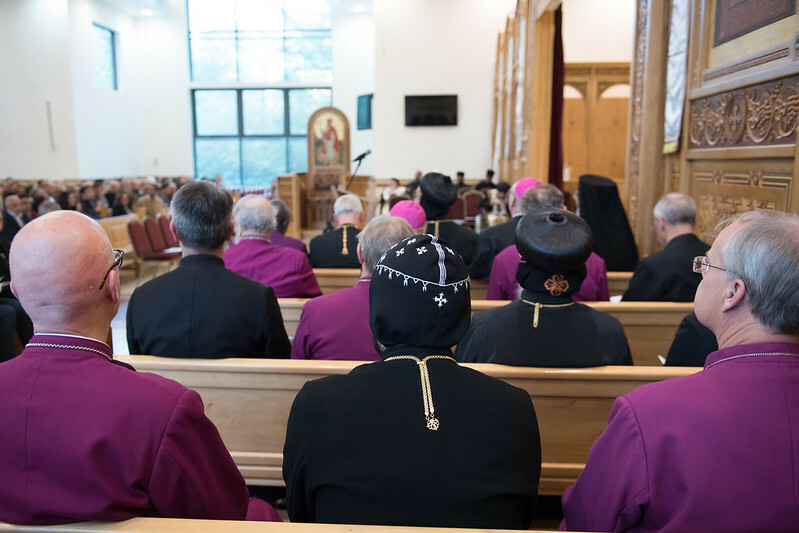 A Vespers at St George’s Coptic Cathedral in Stevenage, 30 miles north of London, on Saturday was attended by senior clergy from the Anglican, Catholic and various Orthodox Churches, as well as by peers and charity heads. 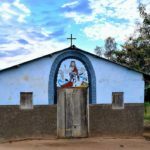 Pope Tawadros in his address linked the rise of violence and terrorism globally to increasingly sophisticated weaponry which enabled people to value machinery above their fellow human beings, but said Christians “must present love in action”. The British Prime Minister, Theresa May, sent a message in which she said the Government valued its “strong, positive relationship” with the Coptic Church in the UK, and noted Egypt’s “unique and special role in defending tolerance and understanding at the heart of the Arab world”. Representing the Catholic Church, Archbishop Kevin McDonald, who is a co-founder of the Catholic Oriental Orthodox Forum, said the Vespers marked “a time of praise, worship and of supplication for our suffering fellow Christians in Egypt and the Middle East”. 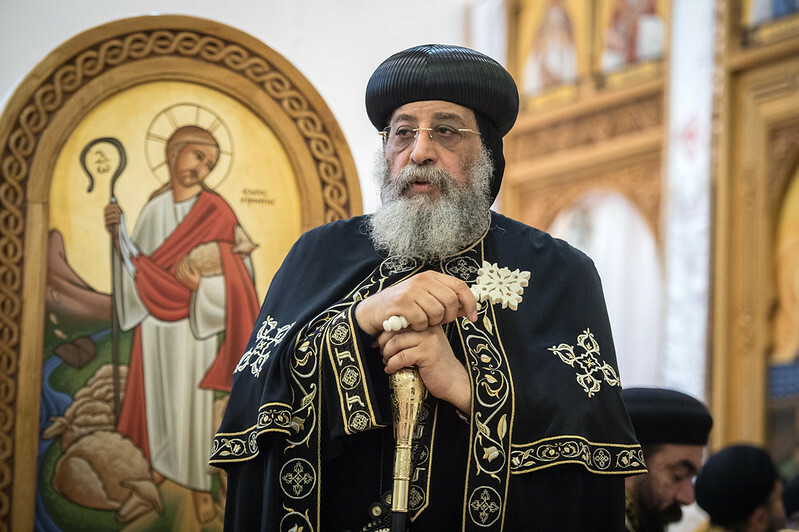 Before the papal address, Bishop Angaelos, General Bishop of the Coptic Church in the UK and the forum’s other co-founder, said the drive to rid Egypt of its ancient Coptic population came not from the majority of Egyptians but from extremists trying to destroy interfaith coexistence. Earlier he said the visit would enable Copts in Britain to hear “directly” from Pope Tawadros about ways to “provide greater support” for their fellow-believers in Egypt. 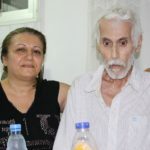 Many of the UK and Ireland’s 20,000 Copts have relatives in Egypt. Addresses were also given by the Archbishop of York, John Sentamu, the Egyptian Ambassador to the UK, Nasser Kamel, and Archbishop Elisey of Sourozh, Primate of the Russian Orthodox Church in the United Kingdom. Pope Tawadros will also meet representatives of other faiths during his stay.